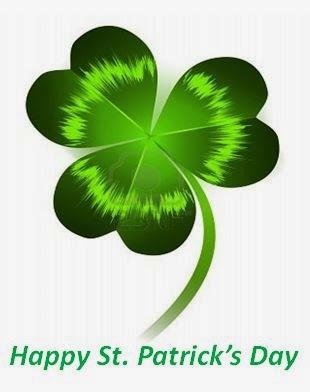 During the fourth century, the man who would come to be known as Saint Patrick was born in Roman Britain. Legend says that the sixteen year old Patrick was kidnapped by Irish raiders and taken back to Ireland. As a slave, he found his faith while tending sheep and decided to stay on the Emerald Isle. Apparently, it's enough to drive a good man to drink - or at least that is what I am led to believe by the customs and traditions that have come to be associated with St. Patrick's Day. I've been thinking that there has to be more to this story to explain what evolved into the modern day celebration. As a child, I learned about the evangelizing Patrick and how the clover was used to represent the Holy Trinity. That made perfect sense, and I could appreciate how Patrick was resourceful - and don't forget saintly. I just couldn't see him wearing a shiny green foil top hat with a clover on it. He was the helpful guy. I've been told there are no snakes in Ireland, because Patrick banished them. See what I mean? Well played, Pat-o. I mean, the Irish have many needs, but snakes aren't one of them, am I right or am I right? We get a good idea of the character of our old pal, Patrick. Which brings me to my main point of writing: what's with all the alcohol? As Patrick shepherded sheep in the beautiful Irish countryside, was he thinking "I suppose I could encourage the Irish to drink more...that would be helpful." Of course not! I'm gonna go out on a limb and say that was someone else's idea and Pat would have had none of it. Maybe one of the Irish raiders (with a name that foreshadowed his impact on history, like "Sean the Obnoxious Irish Party Lad") came up with the idea to drench this holiday in pub juice. I'm sure that Patrick would frown on much of the St. Patrick's Day mayhem and tried to talk some sense into the young raider. I can hear Patrick now, questioning the validity of Obnoxious Sean's promotion of alcoholic excess. "Sean, what are ye thinking? The men will soon fall out with one another, use harsh language and start shouting 'Go Celtics' and the like. Stay away from the drink, it could get out of hand!" "We're not Scots, so quit acting like me ancient grandma! You Romans are the life of the party - not! I'm off to discover Boston," Obnoxious Sean snapped snarkily (hey! I made an adverb!). So the wee party lad filled his knapsack full of cabbage and potatoes, corned some beef and off he went to settle in the new world and turn the rivers of Chicago green. If you consider these extra nuggets of legend and their historical ramifications, modern St. Patrick's Day celebrations might make sense. At the very least, it won't make LESS sense. Actually he is not responsible for ridding Ireland of snakes. A 3rd century Roman, Solinus, noted their absence long before Patrick's lifetime. The clover leaf as an illustration for the Trinity may possibly be from him but not likely since the first time that is attributed to him isn't until the 17th century which is so far removed that the story is questionable. Lie # 103: "No outside food in the movie"